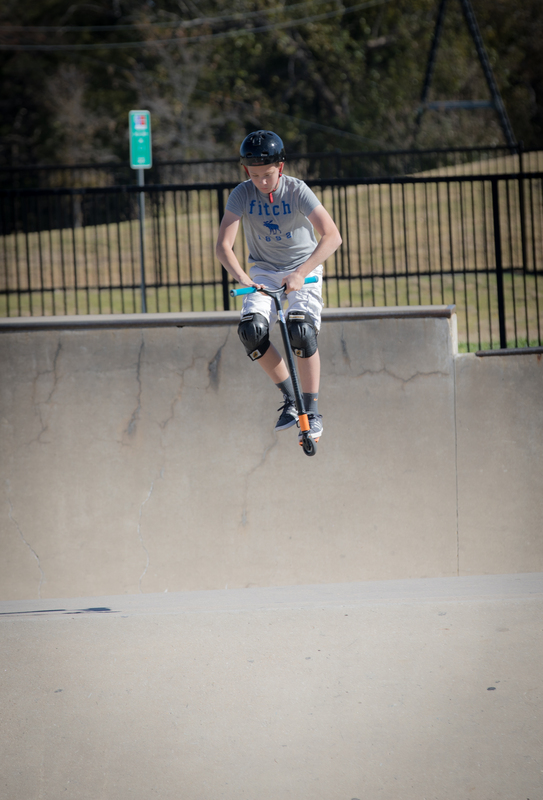 We found out about The Edge Skate Park in Allen just in time. My kids and I have always loved riding our scooters through the neighborhood – on the street, on the sidewalk, on the trail by our house, but mostly in the parking lot at our local elementary school. Lately, they have both been attempting “tricks” on their scooters. Just plain riding around is not enough anymore – especially for my son (almost 10). He wants to jump off ledges and curbs, and jump up and spin in the air and land back on his scooter. You know…things that are way out of my comfort zone. I finally caved in and agreed to take them to The Edge (in Allen) with their scooters in tow. I told them that they needed to be very careful and stay away from the teenagers. When we arrived, I realized I had no idea how popular these places had become with just regular people (like us). It was pretty crowded when we got there – but to my surprise, there were very few teenagers. The skate park was crowded with all kinds of people – very young kids on scooters and skates, tweens on scooters and bikes, and several teenagers on scooters (just a few on bikes). There were even a few adults there on their very own skateboards. I think they were re-living their childhood! I was shocked – all kinds of kids of all ages – boys and girls! And believe it or not, there was a young boy’s birthday party going on too. Much to my surprise, there is a very nice club house on the grounds where the skate park is located. It’s quite a hidden gem. When we went in search of a water fountain we discovered it. This is the amenity center. You can watch the kids skating from inside! It’s very nice! Inside, there were comfy chairs, a couple of television sets, several tables and chairs, and a nice little snack bar. The birthday party group had taken over a table – they had a cake, a stack of gifts, and all the parents were sitting around inside while their kids skated around at the skate park (which you could see through the windows). It was very nice. There is not much information about this park. On the City of Allen Website, you can read a little bit about it. 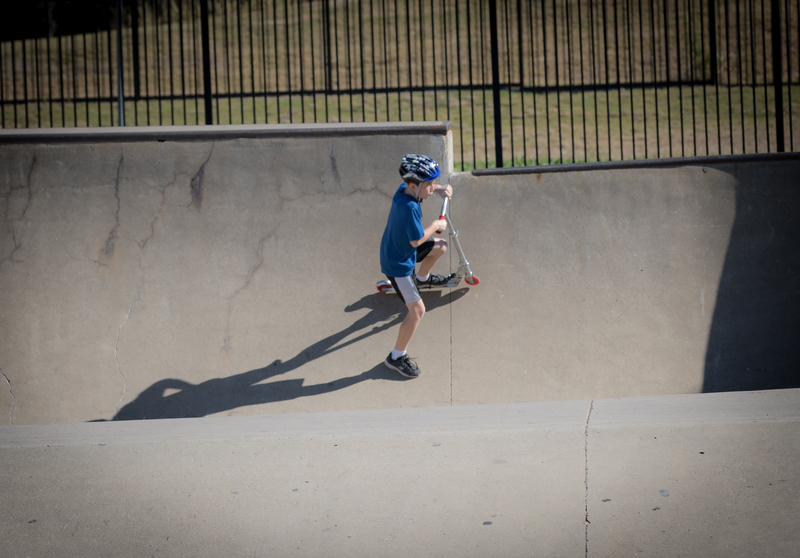 Located on the south end of Allen Station Park, the complex features a concrete skate park, two roller-hockey rinks, BMX track and Visitor Center. 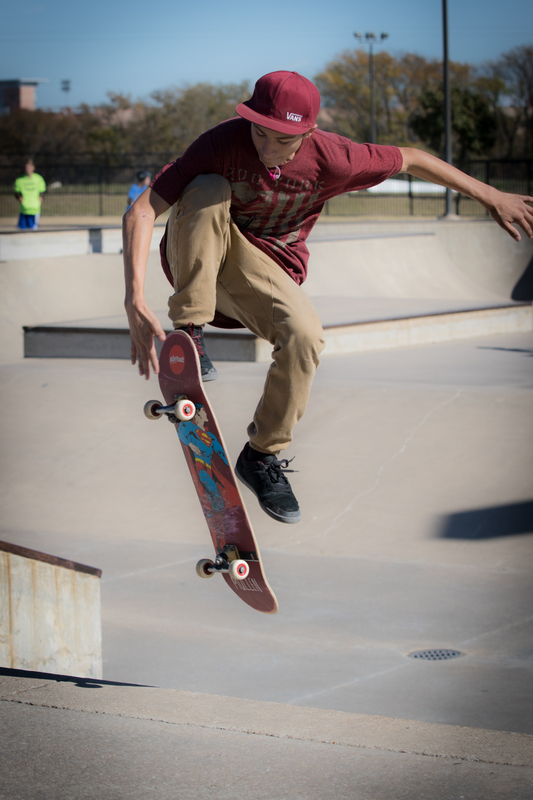 The skate park is now the largest outdoor facility of its kind in the state. Outdoor amenities operate as a traditional park facility with hours of operation from 8 a.m. to 11 p.m. for all skate areas. BMX track hours are from 8 a.m. to dusk. Use of the outdoor amenities is free and open to the public. All outdoor activities at The Edge are considered high risk activities. Safety equipment, including but not limited to helmets, knee and elbow pads, are strongly recommended. 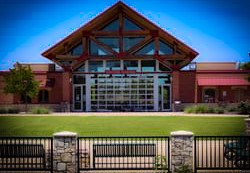 Fees are not charged for the use of the outdoor amenities or the main lobby area of the Visitor Center. He goes up a little bit higher each time we go. Not quite ready for him to defy gravity! The only part that concerns me is how they describe The Edge as “high risk”! Yikes… I guess after sitting there for quite some time watching some of these skaters do their thing, I can see why they describe it as high risk. My kids are not quite at that level, so I’m not worried about them getting hurt…yet! So…maybe the video above explains why they refer to this as “high risk” activities! You think? Can you imagine riding a scooter up a steep incline and doing a back flip? Well…if you can, I’m impressed! I can’t! And I also hope I’m not close by watching when Zach and Morgan attempt something like that! Yikes!! I also found a little bit of information on the skate park on a website called Awesome-Skateboard.com. On this site, I learned that The Edge has 37,915 square feet of concrete – one of the biggest in Texas. It is described as having lots of “bowl elements” with bowls ranging from 6 feet to 9.5 feet deep. These “bowls” also have steel coping for grinding throughout. I don’t speak “skateboard,” but I’m assuming the bowls are what I call the empty pools! I guess if we’re going to hang out here, I need to learn the lingo. In the above video with Zach and Morgan, you can get an idea of what the “bowls” are like! The sides are very steep. The first time he “dropped” into one, I almost had heart failure! I was thinking to myself “if he gets hurt while he’s in the bowl, I’ll never be able to get down there and help him”! I know…what a nut. Actually, I’d probably be able to get down there, but I certainly wouldn’t be able to get back out! The main part, refereed to as the “street course” has stairs with handrails, boxes, ledges, and a lot of banks. Not exactly sure what all of those things are, but I think skaters like them. They’ve also got lights, which is nice for this time of year since it gets dark so early. Since we’ve started going there, we have seen scooters, skateboards, one guy on in-line skates, and some bikes. We usually go early in the afternoon, and it is mostly younger children (8-13) on scooters, with lots of parents sitting around the edges watching. There is also a very helpful website called Free Skate Parks. You can search for your area and see if there is a skate park close to you. It also had some good information about The Edge Skate Park. It’s unbelievable what these kids can do on their boards, scooters, and bicycles! I’m amazed at how easy they make it look. Zach keeps begging me for a new scooter. He wants one that he can do tricks on. He has told me many times that “this Razor scooter is for beginners, Mom.” Oh boy…I’m in trouble. But, I did do some research on great scooters. We have also checked out the BMX dirt bike trail. I am a former mountain bike rider, so I’d love to see my kids get interested in this. So far, they are only interested in the skate park. But…I can imagine a day when they ask to get on their mountain bikes to try and take on this trail. That will be a great day for this mom. I might even use that as an excuse to buy myself a new mountain bike. Hmmmm…guess it’s time for me to start shopping around for mountain bikes. I don’t want to be unprepared, right? Time for a trip to Bicycles Plus – my favorite bike store in Allen! If you are in need of a new bike, I highly recommend this store. It is a small bike shop over in The Villages of Allen (near Moo-yah Burgers and Fries). They are wonderful there.